We are concentrating our efforts on Michael Savage. Click on the Hall of Shame for quotes and advertisers! "vile speeches of the kind we read on my program"
Why Hollywood Liberals Like Dictators, Gangsters, Perverts and Other Sick People -- a sample of Savage's moderate, reasonable views. 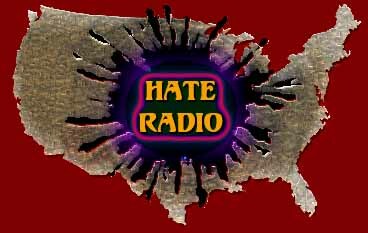 Hate Radio Jocks Sentenced - A cautionary tale as to the consequences of hate. 4-11-2002 Letter in the Eugene WEEKLY in .pdf format.